This document describes functionality only available if you have taken control over a Toolkit configuration. Please refer to the Shotgun Integrations Admin Guide for details. If you are running an older Toolkit installation (set up before June 2013), it is possible that you are creating and managing publishes in an old and now deprecated fashion. This document explains how to upgrade such an installation to match current best practices. Core release v0.14 pushes through a long-discussed change to the Shotgun entities used for publishing. This began as a shotgun-dev list thread on support for multiple representations for Versions in the Shotgun, but quickly extended out into the relationship between review content and publish data. We are moving forward with the community-approved design and the first step is to standardize on common/generic publish entities and field linkages, laying the groundwork for later development in Screening Room. Additionally, the v0.14 release coincides with Tank's product name change heading into public beta. Going forward, Tank will be considered the working name for the Shotgun Pipeline Toolkit (Sgtk), and having Tank-specific naming on any of the entities will not be maintained long term. New clients who start with the v0.14 will do so with the new entities. For existing clients with existing publish data, core release v0.14 provides a a migration utility will help clients safely transfer their data from the old entities to the new ones. This document outlines what exactly the migration entails, and all of the options available for coordinating the switch. However, PublishedFileType is no longer project-specific, and there will be a global set of types that can be used by any Projects (essentially the same concept as Pipeline Steps). Not all PublishedFileTypes need to be used in all Projects, but there is no longer a need to duplicate the same type record in multiple/all Projects and the same one can be reused. For each TankType, create a PublishedFileType if one does not already exist with the same 'code' field, and preserve all field metadata including thumbnails. 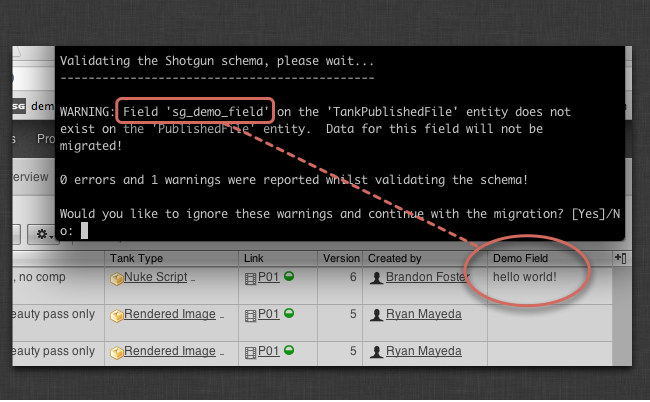 For each TankPublishedFile, create a PublishedFile and preserve all field metadata including thumbnails. 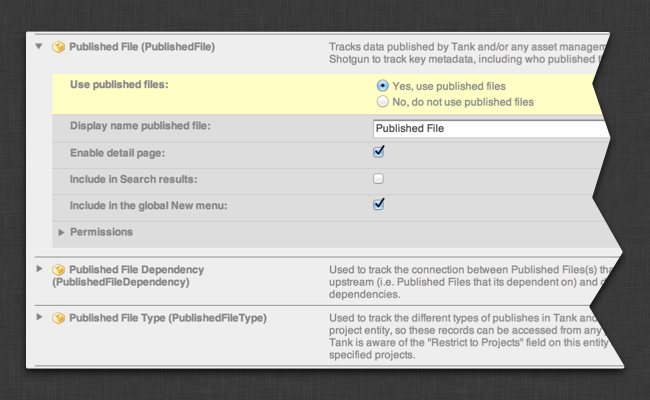 For each TankDependency, create a PublishedFileDependency and link it to the appropriate PublishedFile records. Convert existing PipelineConfiguration(s) with a setting to use the new entities going forward. We are taking every measure possible to ensure a smooth transition, and there are a number of options that admins can utilize to test the migration before switching a production over to the new entities. The legacy 'Tank' entities will remain in place for now, but will ultimately be deprecated. We encourage clients to migrate to the new entities as soon as they reasonably can given production constraints! Also, the migration can be safely run multiple times on the same data set. The migration will "remember" what it has already converted and only pick up new records. This can be useful in a testing context. More details on this below. If a field from the legacy entity is missing and should be migrated, create the field on the new entity. It must have the same field name for the migration to pick it up. By sure to also ensure that any entity or other restrictions are identical between the fields. It is a very common practice to modify the allowable values for the Status field, so make sure these have been set up correctly on the new entity and match those on the legacy entity. If you run the migration on ALL PROJECTS, the utility will give you the option of exiting the migration so 'tank updates' can be run on each Project (since that utility can only be run on a single-Project basis). After updating the engines and apps, you are now ready to run the actual migration! It will follow the order above, first migrating TankTypes to PublishedFileTypes and then moving on to the TankPublishedFiles/PublishedFiles. Note that this migration can take a long time. The example migration of ~400 records took 2 minutes, which is about 3-4 records per second. The biggest performance bottleneck for the migration is thumbnails, since they must be transferred individually over from the old to the new record. Bandwidth will plays a role as well, particularly on the thumbnails, so please be aware and budget your time accordingly! The last step of the migration is to update the Pipeline Configuration(s) for the Project to toggle the setting that dictates which entities to use. If a Pipeline Configuration isn't converted, it will continue to use the legacy entities even if the migration has completed successfully. The migration will allow you to choose which Pipeline Configuration(s) to update. The default is all, but it is also possible to update only your own if you are testing, so production can remain on the legacy entities while you test the new ones. Last but not least, the migration will notify you of any errors or steps skipped. For example, if you didn't run the engine and app updates, it will remind you to! If you didn't update all of the Pipeline Configurations, it will remind you! And so forth. When starting up a new project, the setup_project utility will detect whether or not the new entities are enabled and use them by default if they are. The migration utility was designed to be to be run by admins in a testing context before making a full transition. For clients using Tank in production, or close to it, we strongly encourage running a test migration (or migrations). You do not necessarily need to migrate all Projects at once. This section will go through some of the options available to you. If there are any errors, the migration will figure out how far along it was and pick up where it left off, so anything it already successfully processed won't need to be recreated again. If any custom fields are missed, say if you have additional fields on TankPublishedFile but didn't create them on PublishedFile and skipped that step in the migration, you can rerun the migration after creating the matching fields, and the metadata in those fields will be transferred. You can run the migration on a live Project but only convert your own (cloned) Pipeline Configuration, which will transfer all publishes at that point in time for you to test with. If more publishes are created with the legacy entities during your testing phase, you can rerun the migration to pick up the interim records as well as convert the rest of the Pipeline Configurations. It will not undo the entity migration, and any migrated entities will not be retired. 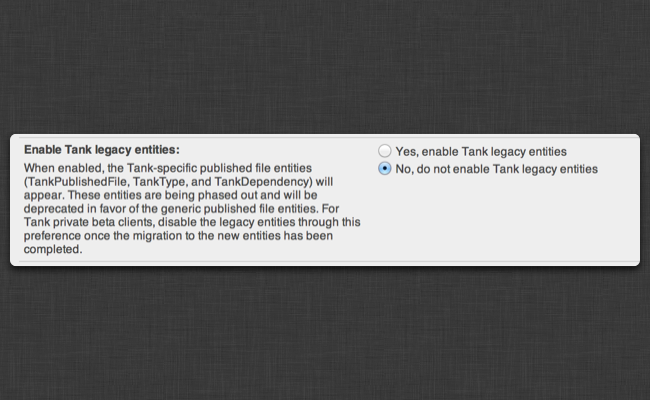 It will not migrate new PublishedFile entities back to the legacy TankPublishedFile entity type. The flag follows the same hierarchy as any other shell engine command and flag. So, you can choose to back out your own Pipeline Configuration, all of the Pipeline Configurations for a Project, etc. 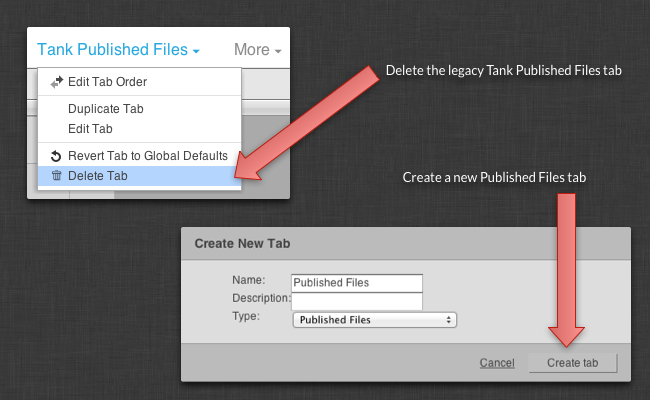 Finally, remember to remove any detail page tabs that display the legacy TankPublishedFile, since disabling them in the Shotgun Site Preferences will not remove them from the layouts. Go into Design Mode on your detail pages, delete the legacy tabs, and create new tabs for the new entity. You will also want to ensure your Global Default Layouts have the new entities as well!